Though Goro Miyazaki's first foray into the director's chair was a huge success at the box office in Japan - viewed by more sets of eyes than any other Japanese film in 2006 - his take on Ursula K. Le Guin's Earthsea books did not meet the standards of one particular set of eyes: his own father's. Goro is, of course, the son of master animator and co-founder of Studio Ghibli, Hayao Miyazaki. Famous for his gorgeous fantastical flights in the art of hand drawn films, Miyazaki senior was NOT happy with his son's decision to rework the story into a modern anime style movie and away from the warmer manga-inspired works that Ghibli has produced over the last two decades. Father and son had not been particularly close beforehand, but the production of the film caused an even deeper rift between the two men. I find it's always wise to stay out of any family feud, but in this particular case I'll make an exception - the elder Miyazaki is right. It's not so much that Goro moved away from the style that made Ghibli what it is today (though Le Guin herself was very disappointed with his decision) or that he didn't stay true to his father's initial vision for the film (Hayao wrote a treatment from Le Guin's books entitled "Shuna's Journey"). It's that he did something unforgivable. He made a boring movie. Not just dull, but a plodding, poorly-paced, jumbled affair that, aside from several small moments and images, would never bring to mind Studio Ghibli's great history. Apparently based mostly on the third and fourth books of Le Guin's six novel series (she had several short stories outside the books based in the Earthsea domain as well), it begins with the cautionary message that people are acting strange these days and that dragons (who many years ago left the land of the humans) have been spotted in several places. A young Prince named Arren kills his father the King for what appears to be no good reason and, after he flees, receives guidance and assistance from Sparrowhawk the archmage who is known as one of the strongest of the wizards. To avoid capture by the castle guards and the slave traders, Sparrowhawk hides him out in the country with Tenar and Therru (a young girl that Tenar has taken under her wing). The evil Cob, a wizard who seeks eternal life, also wants revenge against Sparrowhawk and uses Arren's darker side to pull the archmage into a trap. At the root of this interpretation is the message that life is to be cherished and that you must always be true to yourself - not exactly the most original set of morales ever constructed, but the initial premise of the film married with this concept could have proved quite interesting. When humans and dragons went their separate ways many years ago, it was a difference of opinion that led to it. Humans wanted wealth and possessions while dragons wanted simple freedom. When the dragons begin to show up in the human's world again, there seems to be a shift in "the balance" which might explain the weird behaviours and events. This could have proved interesting, but so little gets done with the concept. The story can't even stay true to itself as it wanders from the four people hiding out to the slave traders to Cob's fixation on Sparrowhawk and pulls in new bits of information when it deems it necessary to move a plot element forward. Worst of all, during some of the more confusing sections of the film, I never felt any confidence that I'd be guided through to any understanding of what's really going on nor could I work up the energy to really care. The film is almost totally without humour or subtlety and its characters have nothing endearing or even memorable about them. 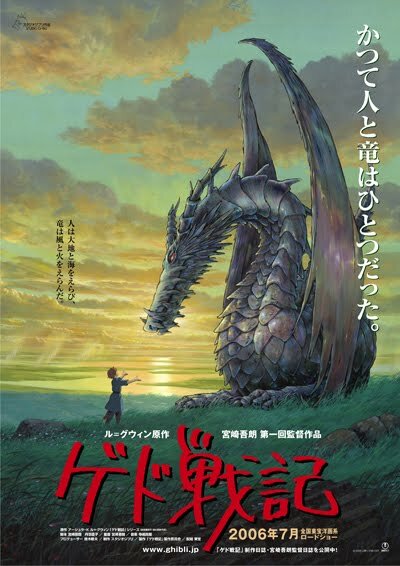 There's a sword, bits of magic and a lot of talking about life and death, but never do we get any feeling for what Earthsea is like - the story could have been set anywhere. For all the initial concern about the world going crazy and dragons returning, we never again see any signs of the former and the latter only return in the last 20 minutes or so of the film. The reason for the return is one of the stronger points of the entire story, but it's far too little and far too late. Even some beautiful background painting simply can't forgive an utter lack of imagination in taking the story anywhere of note. One hopes that father and son repair the relationship - Miyazaki junior needs to remember where he came from and be true to his name.